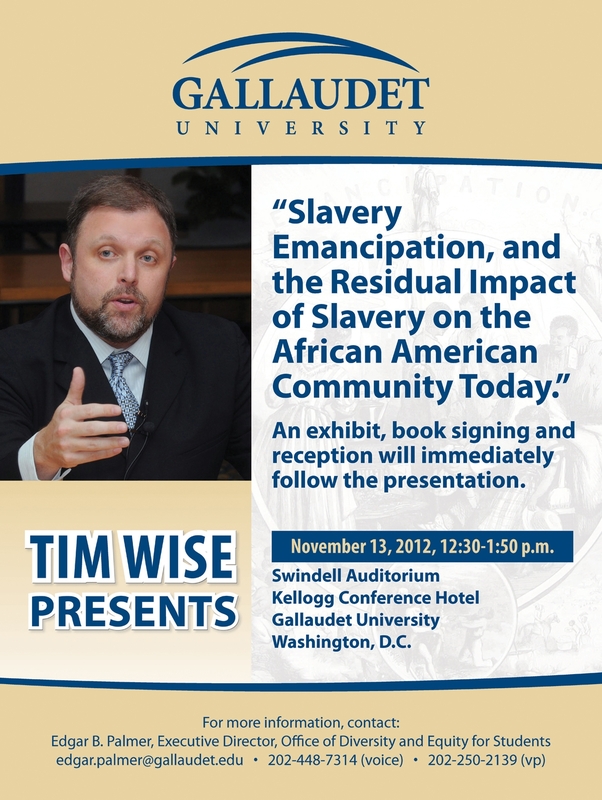 Tim Wise, anti-racism activist and writer, will speak at Gallaudet University on Tuesday, November 13 from 12:30-1:50 pm. The topic is “Slavery, Emancipation, and the Residual Impact of Slavery on the African American Community Today.” Mr. Wise’s presentation will be followed by a book signing and reception. The event is free, open to the public, and will be held in the Swindell Auditorium at the Gallaudet University Kellogg Conference Hotel. Posted on November 8, 2012, in Events and tagged Gallaudet. Bookmark the permalink. Leave a comment.